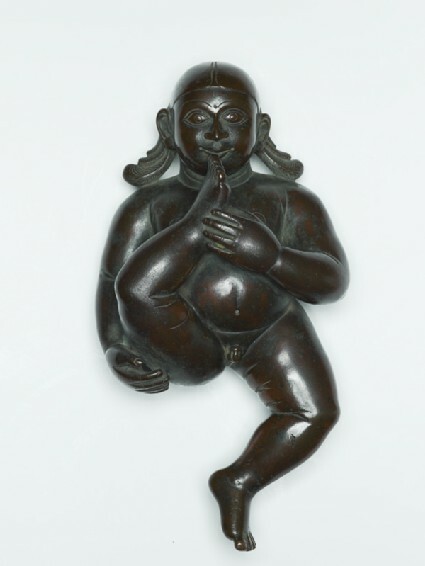 Kṛṣṇa as a baby, lying on his back on a banyan leaf (missing here) and sucking his toe, is a popular image in South India. Many of the cowherd god’s exploits related in the Bhāgavata-Purāṇa [see EA1980.2] were performed while he was still an infant. In fact, while still in the womb he was able to overcome his adversaries. The Museum possesses several small bronzes of Kṛṣṇa while still at the crawling stage. He is shown having just stolen the butter, one of his childish pranks. Here, however, he is younger still but nonetheless stands for the Supreme Viṣṇu, an interesting example of the tendency amongst all Indian religions, in their later phases, to share the same types of metaphysical speculation, in this case the identification of the supreme principle (compare the Ādi-Buddha of Mahāyāna Buddhism) underlying all the cosmological and philosophical manifestations of the god with an iconographically defined image, in this case, and quite appropriately, a naked infant. 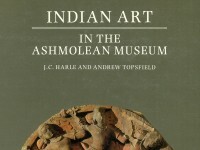 While in northern and particularly western India, the treatment of the human body in sculpture in the later periods tends to be an acute angularity and exaggerated poses, in South India, outlines of drawings favour flowing arcs and circles [see EAX.264] and in sculpture the use of globular masses is often the rule. The latter, as one sees here, are eminently suited to the plastic forms of a chubby baby.